We’d all love to get our hands on a slice of gold or two, and if you’re lucky while playing this pokie from Aristocrat you’ll have plenty of chances to win some. 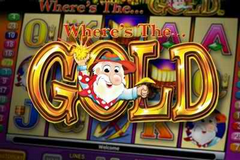 Where’s the Gold is a five reel game that features 25 paylines, and while much of the excitement here is attached to the special feature that shares its name with the title of the pokie, there is still plenty going on in the main game too. The theme is based around a wrinkly old gold digger that is trying his darndest to uncover a stash of the good stuff. He’s got his pickaxe, his cart and even some dynamite to help him on his way, and if he is to be successful he’ll your help with some profitable spins of your reels. There are all manner of symbols available that are linked to the ‘gold digging’ theme, but it’s the playing cards that get us started as ever. Remember, all wins are multiplied by your bet amount per line, and the denominations listed below are based on the minimum bet. So as we were saying, those playing cards. The Jack pays at the rate of 10, 40 and 100 times your line bet for matching three, four or five symbols on a payline, while the Queen measures up at 20, 50 and 100 times respectively. Next up is the King, and this regal chap will deliver 30 times your line bet for spinning a treble, 70 times for a quadruple and 125 times for a quintuple. And lastly there is the Ace in the pack, who rewards players with 40, 80 and 150 times for three through to five. Now we’re into the ‘character’ symbols, and this is where the prizes start to mount up. The Pickaxe and the Cart earn 50, 100 and 300 times your line bet, with the Goldmine rewarding intrepid adventurers with 2x for matching a pair, 80x for three, 150x for four and 500x for five. But the best of the bunch is the Gold Digger himself, who when he’s not asking “Where’s the Gold?”, he’s off earning players 4, 100, 200 and 1,000 times their line bet for two matches through to five. There is also the chance to power up your winnings via the Gamble feature, which rewards players for their bravery by paying out at 2x for correctly guessing the colour of a playing card and 4x for correctly guessing the suit. Be warned though: guess incorrectly and you will lose your original win amount. If you’re going to find some golden treasure beneath the surface, you need some pretty powerful dynamite to make things happen. And that’s lucky for players of Where’s the Gold as the Dynamite Sticks are the scatter symbol here. This will pay at the rate of 2x, 10x and 50x, and the only difference is that these wins are multiplied by your total bet amount, not just the line bet. It will even pay anywhere on your reels, rather than having to land on a payline. There is more to this Dynamite than meets the eye, however. Three or more sticks triggers the eponymous Where’s the Gold feature, where players will be handed up to ten freebies and three wild gold symbols to use wisely. Here you will be asked to select a character, and the number of free spins you will be awarded is made known here too. The usual symbols could be replaced on your reels by their golden counterpart as well, and these babies are wild and substitute for all other game symbols (apart from the scatter that is). Hopefully this has got your mouth watering at the prospect of the potential prizes available here, and it gets even better: the feature can be re-triggered with additional freebies awarded. And that’s the beauty of Where’s the Gold: on the surface it looks like a standard pokie from Aristocrat. But delve a bit deeper and you will find a special feature packed with plentiful prizes, while the main game payouts are enough to keep you on the edge of your seat. Gold? Who needs it when payouts like these are up for grabs!